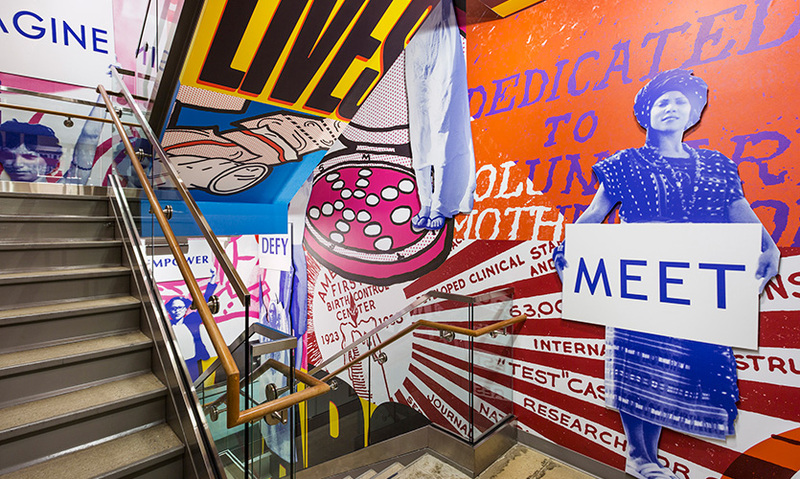 A large-scale installation that spotlights Planned Parenthood's dynamic history has been designed and installed at the organization's new national headquarters in New York. 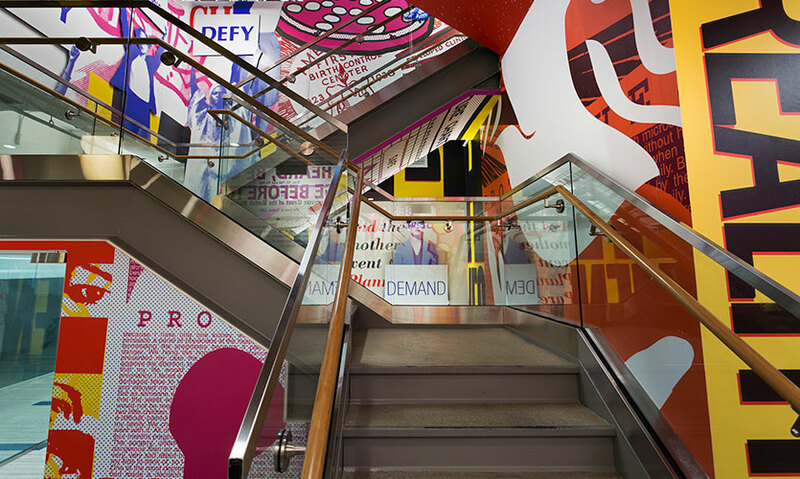 The mural is a colorful collage that remixes graphics from a century of ephemera created by Planned Parenthood, capturing its dedication to quality care, education and activism. To create the mural, the designers researched historic images, selecting approximately 30 for the final display. The images were then digitized to assemble the collage. The main mural ascends through a three-story staircase at the center of the office. The graphics are incorporated elsewhere throughout the headquarters as well. Smaller murals have been placed on walls in large conference rooms and other meeting spaces. 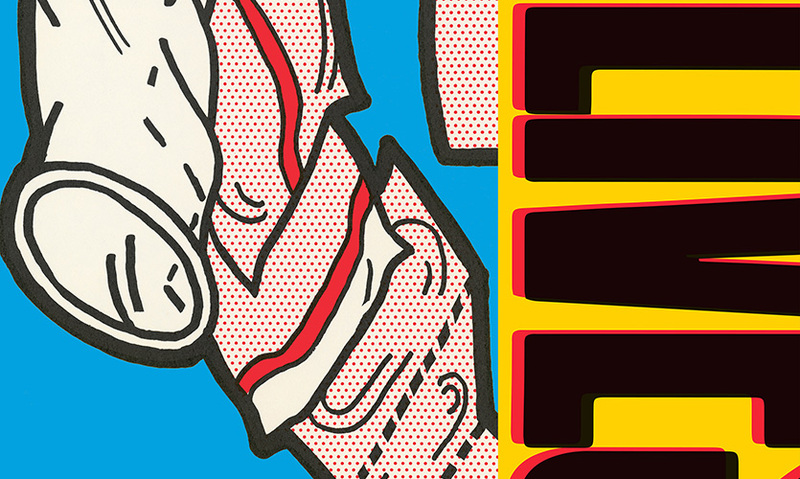 The archival images have been reinterpreted using Planned Parenthood's own color palette, with the addition of yellow, to help tie the environmental graphics into the existing brand identity. For over 100 years, Planned Parenthood has fought for reproductive health and rights, championing the idea that women should have the information and care they need to live strong, healthy lives and to manage their own fertility. Currently, the organization is powered by nine and a half million activists, supporters, and donors nationwide. The large-scale installation that spotlights the dynamic history of this remarkable organization was designed for its national headquarters. 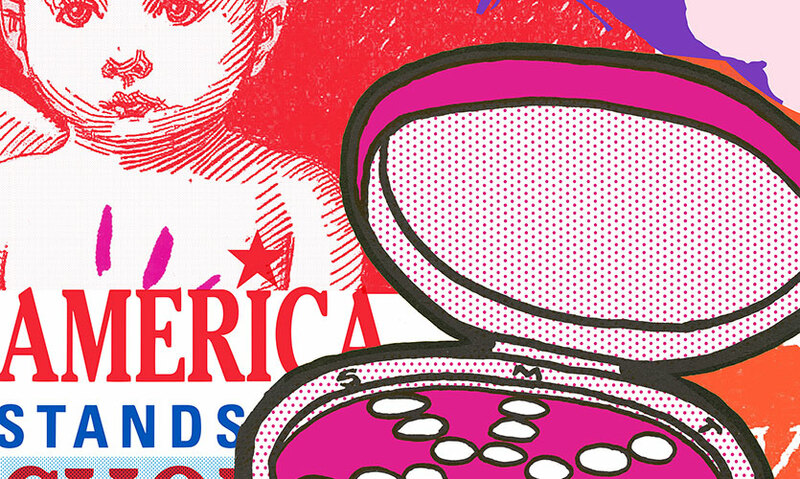 The mural remixes graphics from a century of ephemera created by Planned Parenthood, capturing its dedication to caring, education, and activism. 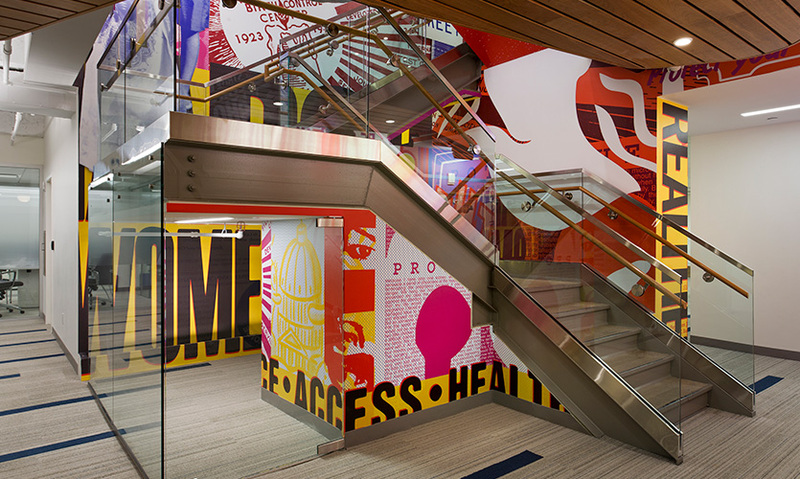 The mural is installed at Planned Parenthood’s new national headquarters in Lower Manhattan. 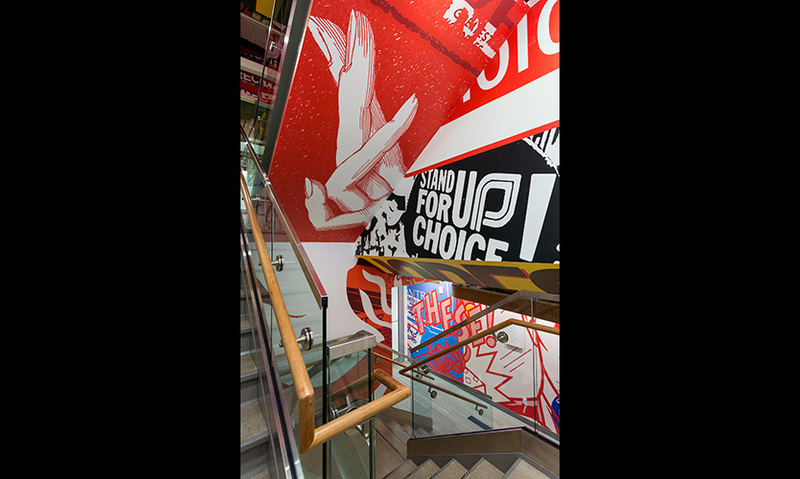 The project scope included a mural extending through three stories of a stairwell, a donor wall, wayfinding, and code signage. Parts of the mural were also installed in conferences rooms and smaller walls throughout the space. The designers worked closely with leadership at Planned Parenthood to develop the installation. The main mural ascends through a three-story staircase at the center of the headquarters. The designers collaborated with the project architect, Juan Matiz of Matiz Architecture and Design, to integrate the graphics in a high-profile location in the offices. The mural was timed to coincide with Planned Parenthood’s centennial in October 2016, and the original project brief asked to highlight the organization's history, which is complex. The design team looked at the chronology and observed that the one factor running throughout the narrative was the extraordinary passion of the group’s supporters and activists, who have been truly heroic in their fight to make reproductive healthcare a reality for women. The mural is a colorful collage composed of ephemera from a century of various initiatives—a mix of newspaper ads, instructional posters from clinics, protest posters, pins, photos of protests, and other historical material from the Planned Parenthood archive. 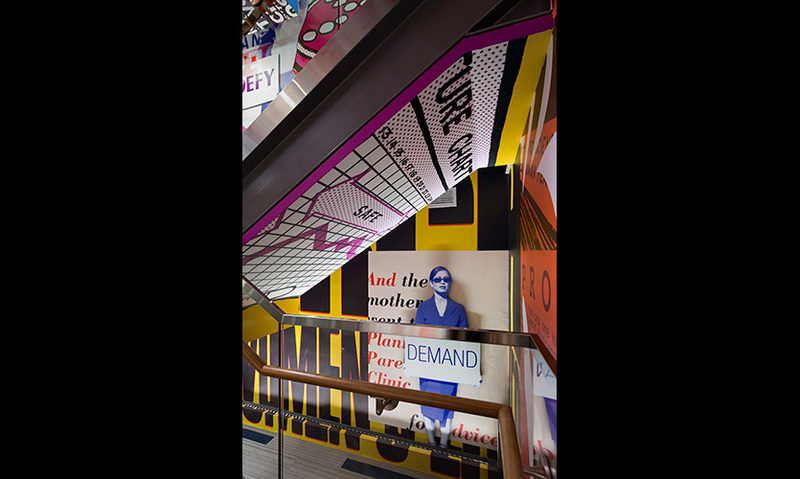 The installation acknowledges the important role that activism and posters, placards, symbols, and other graphics have played in garnering support. Many of the designs were originally created by grassroots activists, and the mural is a tribute to their impact in the movement for reproductive rights. To create the mural, the designers researched historic images, selecting approximately 30 for the final display. The original images were of varying age and quality, so the team digitized the pieces to assemble the collage. The mural is fabricated of vinyl wall-covering, built in layers for a dimensional effect, with acrylic forms cut out and mounted over the surface. The archival images have been reinterpreted using Planned Parenthood’s own color palette, with the addition of a bright yellow, to help tie the environmental graphics into the organization’s existing brand identity. The graphics are incorporated throughout the headquarters: In addition to the central installation, which is about 30 feet high and rises over three stories, smaller murals have been placed on walls throughout large conference rooms and other meeting spaces. The mural has been welcomed as a colorful focal point and call to activism in the national headquarters. 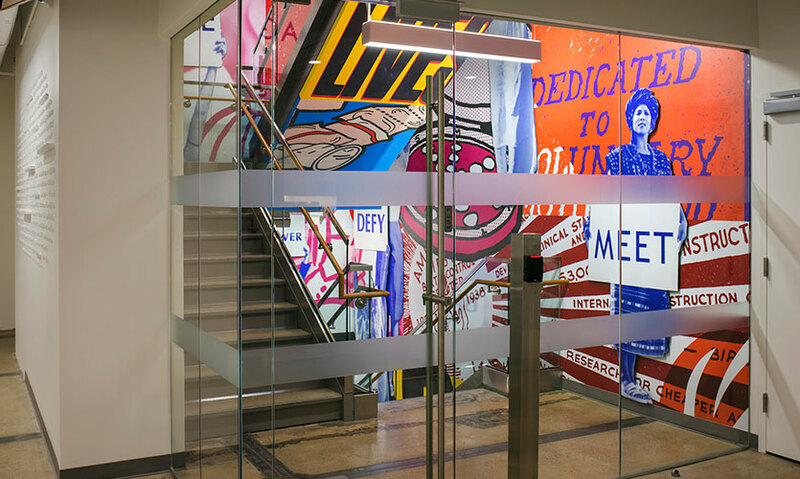 When leaders of Planned Parenthood’s affiliates saw the installation, they started requesting similar designs for their own health centers, and the designers are currently developing a system of supergraphics that can be adapted for various locations. "'March on now as then.' A design team’s deep dive into Planned Parenthood archives results in a contemporary call to action. By constraining this vibrant collage within a restrained interior, the effect becomes more powerful." "Creating engaging content from historical archives can sometimes prove to be quite the challenge. By highlighting the previous achievements and milestones of women who were crucial in the advancements of reproductive rights, this installation serves as an inspirational reminder to those currently working to continue the efforts of women past. 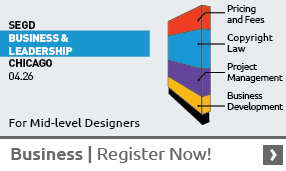 The graphic approach in the stairwell is an energetic shock embedded within a more reserved office space. To me, this speaks to the urgency and electricity with which Planned Parenthood continues to advocate for women's health, fighting with admirable persistence and ferocity."